Creating a new character World of Warcraft might be an unfun exercise in grinding, but it also gives orc players the opportunity to experience the Valley of Trials, my favorite area in the game. I recently re-installed World of Warcraft’s bulky 50GB+, and then I went to my Blizzard account page to activate my subscription. Right there, in cold numbers, the game told me that the last time I played it was two years ago. I had come back to the game for a couple months of the Legion expansion before abandoning it again, much like I had done for Warlords of Draenor and Cataclysm before it. I skipped Mists of Pandaria and only played a little bit of Wrath of the Lich King, but I was a committed Burning Crusade player for more than a year during its peak, casually leveling characters and never really getting to end-game content in a serious way. I’m a veteran dabbler, part of the big spike of players that WoW always has when a new expansion comes out, but I’ve tried to get ahead of the ball with the upcoming Battle for Azeroth. I wanted to get in there to see what had happened in the past couple years since I dinged into the level cap and just sort of stood around wondering what I was supposed to do next. So I created a new character, Fortunati, who is an orc woman dedicated to the career of being a warlock. After a short cinematic, she popped up in the Valley of Trials, and I experienced this odd moment of a full decade of video game memory slamming into the fore of my mind all at once. There was my troll hunter, played on a friend’s account before I owned a computer, and then there was my orc hunter when I finally got some kind of computer that could run it at minimum settings. I took him all the way to the end of the Burning Crusade, up into the gates of Karazhan, but he started here in the Valley of Trials fighting boars and scorpions and cultists. Years later, my troll shaman did the same in the wake of the cataclysm that forever shifted the shape of Azeroth. When we talk about “retro” games or “throwback” experiences in games culture, we’re really talking about the echo of some experience that we once had. We’re playing Super Mario Bros. now to remember what it was like to play Super Mario Bros. back then. And, similarly, when I turn on Pillars of Eternity II, I’m getting this weird facsimile throwback to Baldur’s Gate. In most game experiences, we have a sense that we’re further along in history and that the time of this game, whatever era it is from, hails from that time. But when I start beating up scorpions in the Valley of Trials, it doesn’t feel like I am playing a game from back then. It’s not a throwback game, because the game is now. It’s still going. Because I am basically killing the exact same cultists in the Valley of Trials now that I killed there back with that troll hunter, it doesn’t feel like these events are a decade old. They feel fresh and contemporary. The Valley of Trials also makes something clear that’s easily lost in the narrative bombast of most of World of Warcraft: this is a universe of brutal conflict, and there are always more troops ready to enter into the battle. They come to the Valley of Trials to do chores and clonk grunts on the head to make them work, but then they get stronger and become the saviors of worlds. 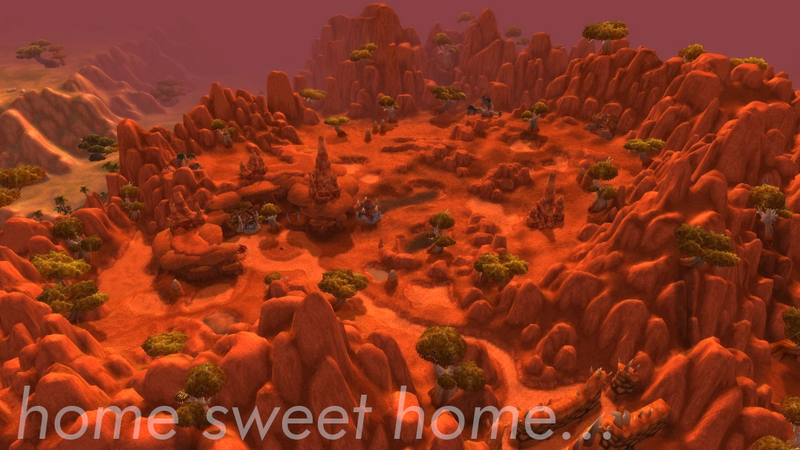 This is the starting point for millions of unique player and character stories, and it unifies so many people who play for the Horde side of the game (although obviously not all, since there are different starting locations). The Valley of Trials is special to me because it constantly makes me think of the characters I’ve made, the friends I’ve leveled with, and the humble beginnings of every WoW story that eventually ends with continents being sundered and the defeat of giant entities from beyond time. It’s a small place, with small people, and it’s always there when I want to come back to it, no matter how much time I spend away from it.